It’s Christmas Bird Count season, and if you know Christmas Bird Counts you have probably heard the tale of how Frank Chapman invented this winter tradition to replace the older and considerably less optimal for birds tradition of the Christmas side hunt. Of course, that’s not the only Yuletide ritual with uncomfortable implications for the Class Aves. Or specific members thereof. And I’m not even talking about dinner. December 26, the day after Christmas, is the Feast of St. Stephen according to the Catholic calendar (you may recognize this from the carol Good King Wenceslas or from the occasional grumble that Boxing Day is too secular.) Various bits of Europe celebrate the day in various ways. Sleigh rides. Blessings. Feasting on pasta. Drinking. In Ireland they killed Wrens. And tied them to the top of sticks. And then paraded them through town. The explanations for this vary, and in this case it’s probably as much a result of the syncretic folk process as the Internet just lying all the time. And article in Smithsonian mentions several theories, including that the Wren represented the old year and needed to be got out of the way; that the Wren was symbolically associated with various episodes in the life of Jesus and was thus associated with kingly sacrifice; that a chattering Wren betrayed St. Stephen, leading to his martyrdom, and the species needed to be punished; or that a Wren had woken a band of Viking warriors prior to a raid by the Irish on their camp, leading to the defeat of the Irish forces and lasting interspecies animosity. I like the first one best, especially since the parade of the dead Wren involved collecting money for its burial – hardly what you’d do for a bitter enemy. Of course, I could also see the theory that wren-hunting kept energetic young boys out from underfoot all day for two days in the dead of winter when everyone else was cooped up in the house and busy cooking for a series of religious feasts, getting steadily more sick of each other. At any rate, time and cultural standards marched on and today the ritual is performed with dummy wrens. It’s still an eerie bit of Celtic folklore that would do Christopher Lee proud. 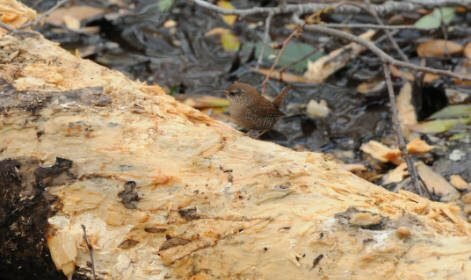 And, of course, it has nothing to do with the fact that the Stephen’s Island Wren, an endemic species from the coast of New Zealand, is now extinct. Feature Image by Mark Musselman, courtesy of the USFWS. 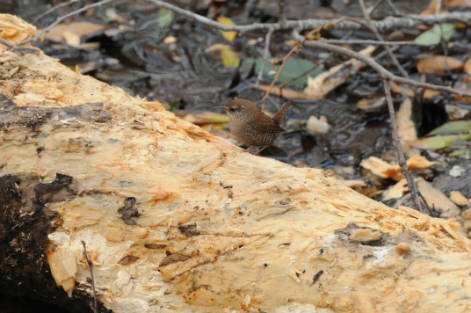 The Winter Wren was once considered conspecific to the Eurasian Wren, but wren-hunting never became widespread in America. Elizabeth Atwood Lawrence’s “Hunting the Wren” is the best summary and analysis of all this Wren folklore. Deeper meanings involve sacrifice, the semblance of a crucifixion of the wren, its association with a thorn bush, the image of the small raised up in adulation- all of which have associations of a religious nature which are reinforced by aligning the Wren Hunt (which some parts of Britain had done on Christmas Eve, or Valentine’s Day, or New Year’s Day) with the feast day of the proto-martyr Stephen. Several years before Frank Chapman’s Christmas Bird Count, William Leon Dawson in 1897 suggested that students going home from Ohio State University for Christmas make an effort to record the species and numbers of birds they saw (the term of art for this listing at that time was a “horizon). See Mark Barrow’s “A Passion for Birds: American Ornithology after Audubon” for more.